The U.S. NTSB issued an investigative update on the July 7 San Francisco Airport near miss incident. Air Canada flight 759, an Airbus A320, was cleared to land on runway 28R at San Francisco International Airport, but the airplane lined up on parallel taxiway C, which had four airplanes on it awaiting takeoff clearance. 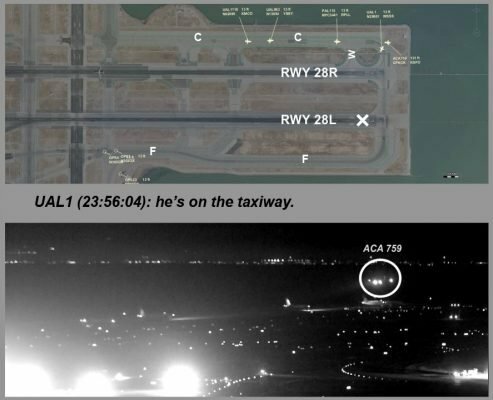 Air Canada flight 759 descended below 100 feet above the ground and initiated a go-around after overflying the first airplane on taxiway C.
The captain was the pilot flying ACA759, and the first officer was the pilot monitoring. Both pilots held Canadian airline transport pilot certificates. Runway 28L was closed to accommodate construction; its approach and runway lights were turned off, and a 20.5-ft-wide lighted flashing X (runway closure marker) was placed at the threshold. Runway and approach lighting for runway 28R were on and set to default settings, which included a 2,400-foot approach lighting system, a precision approach path indicator, touchdown zone lights (white), runway centerline lights (white at the approach end), runway threshold lights (green), and runway edge lights (white at the approach end). The incident pilots advanced the thrust levers when the airplane was about 85 feet above ground level. Flight data recorder data indicate the airplane was over the taxiway at this time. About 2.5 seconds after advancing the thrust levers, the minimum altitude recorded on the FDR was 59 feet above ground level. Both pilots said, in post-incident interviews, they believed the lighted runway on their left was 28L and that they were lined up for 28R. They also stated that they did not recall seeing aircraft on taxiway C but that something did not look right to them. Automatic Terminal Information Service Q was current and included an advisory that runway 28L was closed and that its approach lighting system was out of service. Lights for taxiway C were also on and set to default settings that included centerline lights (green) along its length. Default settings also included edge lights (blue) and centerline lights (green) illuminating the transition or stub taxiways from the runway to the taxiway. The first aircraft on the taxiway was a Boeing 787-9 Dreamliner, the second one an Airbus A340-313. Both aircraft have a tail height of about 55 feet.